What will our world look like in 30 years? Many of us fear the worst. Today, violent storms and wildfires are ripping through the world; we’re rapidly losing crop biodiversity; and large numbers of people are already suffering from chronic food insecurity. Any of these situations, it seems, could spiral out of control over the coming decades. But why just worry about the future when you can step into it? Anab Jain, a TED Fellow and the cofounder of London future-design studio Superflux (watch her TED Talk: “Why we need to imagine different futures”), builds potential tomorrows that people can experience firsthand right now — and gain insights that we could apply to take control of our destinies. “A lot of us in the West don’t think climate change is our problem; we always think about it as somebody else’s problem,” Jain says. “It’s too big and too difficult to deal with. 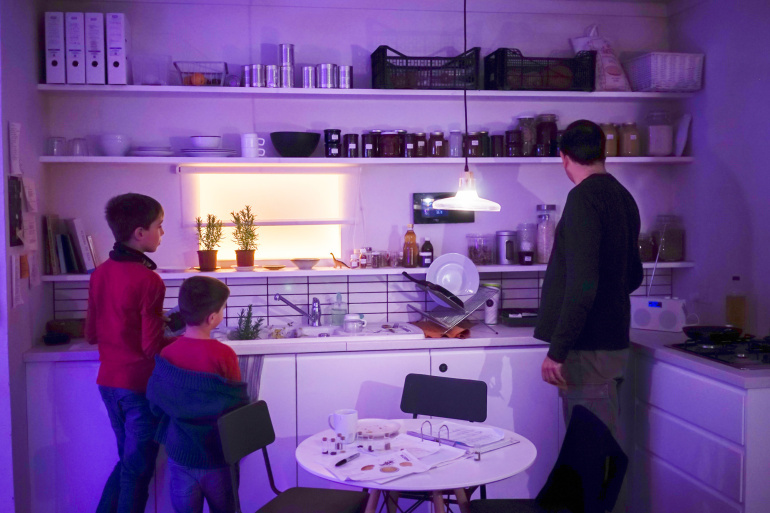 We take in the data, but we don’t apply it to what this means for our own lives.” In an installation called Mitigation of Shock, the Superflux team aim to show us what our lives might be like if we do nothing to combat global warming, by taking us into a flat in London — in the year 2050. Let’s step in …. A door marked “64” takes you into a small apartment. There’s a couch that looks like it was just sat on. Shelves contain a family’s worth of books, toys and gadgets, and a coffee table holds a partial cup of coffee and a half-eaten cookie. Beyond the dining room table is a kitchen counter with recipe books; shelves overhead are full of containers of home-preserved food. The radio is tuned to the news. So far, it’s not that different from many apartments you could find in Europe today. But as you look around, your gaze falls on a newspaper on the coffee table. The headline reads “Worldwide crop failures in 2049: How will we eat?” You hear the radio announcer talking about eco-terrorists, the hijacking of supermarket trucks, extreme weather and poor air quality. Flip through a ledger on the dining room table, and you’ll see a record of the family’s experiments in growing food, next to vials of carefully labeled seeds. The jars of preserves on the shelves turn out to be marked with the month, year and place where the food was foraged. Scan the cookbooks on the shelves, and you’ll see titles like How to Cook in Scarcity and, more alarmingly, Pets as Protein. Recipes tacked to the kitchen wall offer ways to prepare mealworms and foxes. Turning the corner into the next room, you realize that you’ve wandered into a factory of sorts. 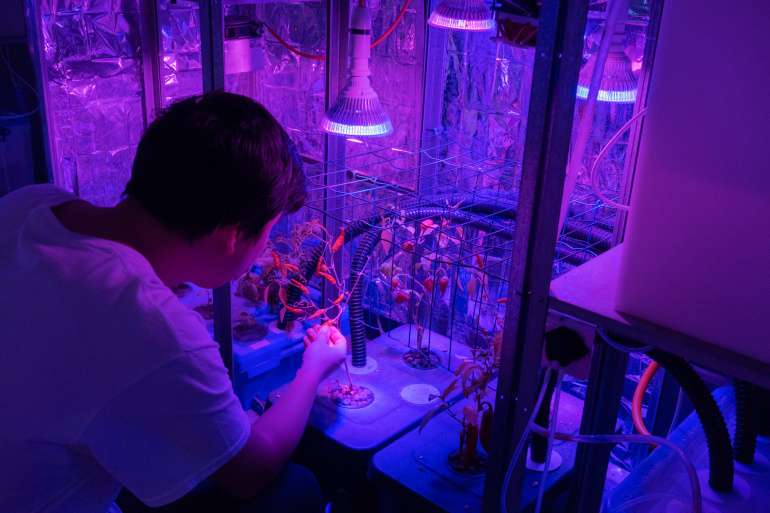 The humming space is bathed in a fluorescent glow, and the industrial shelving units are filled with boxes of plants growing in a swirling fog circulated by tiny fans. Oyster mushrooms are being cultivated on the top shelves, along with smaller plastic containers full of live mealworms. As you peer out a window above a table brimming with a jumble of hardware, you can see storm clouds darkening the sky as people squabble over food in the streets. “We created this living space to imagine what we might need to live in a world where some of the most drastic impacts of climate change have already occurred,” says Jain. Mitigation of Shock — which is now on view at Barcelona’s Centre de Cultura Contemporània de Barcelona (CCCB) — is part of an exhibition called “After the End of the World,” which envisions the future toll of centuries of human impact and negligence. The installation takes what’s happening now and fast-forwards the action in one specific direction. In that way, it’s less a calculated prediction than an educated extrapolated guess of the future.